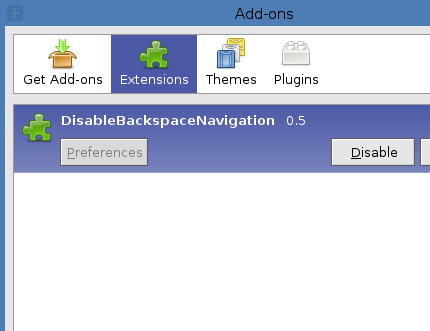 DisableBackspaceNavigation is a small extension for the Firefox web browser. The extension removes the navigational functions from the backspace key. 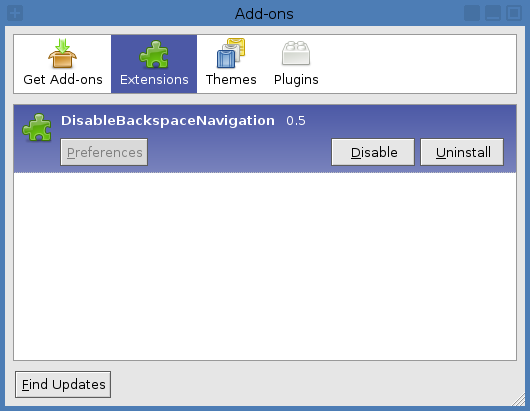 Reviews and statistics about this extension can be found at the Firefox Add-ons page. The extension has been tested with Firefox 1.0, 1.5, 2.0, 3.0, 3.5, 3.6, 4.0 and 12.0 under Debian GNU/Linux and Windows Server 2008. The source code is released under the terms of the GNU General Public License version 2. Updated for Firefox 2.0 (by Elliot Reed).